I am home from Japan now and due to a computer glitch I wasn't able to download photos my last few weeks there. 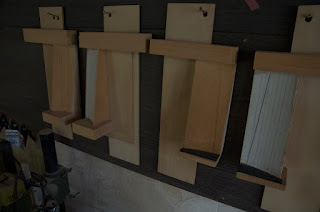 So now its time to catch up and offer some blog posts on a few interesting things we did our last few weeks. I visited the shop of Mr. Shuji Nakagawa, a well-known bucket maker just outside of Kyoto. 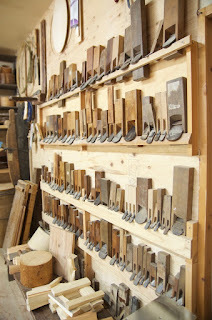 It was the day after he'd had an open studio but he met us there regardless and was very generous with his time. 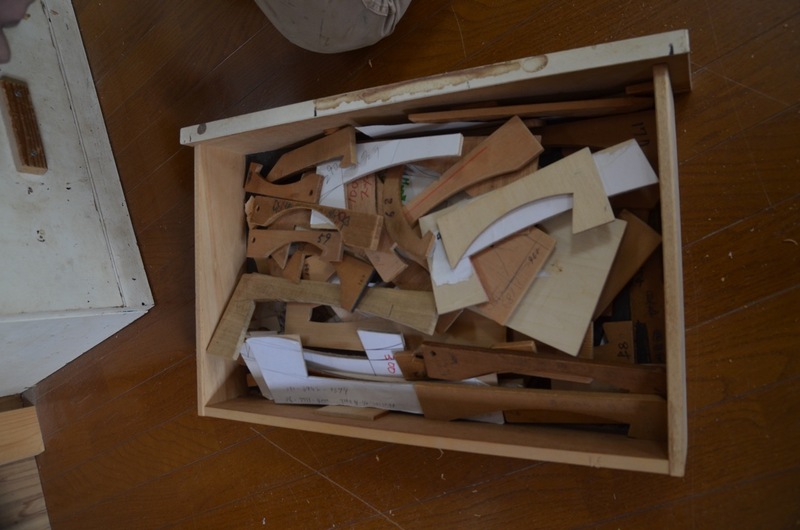 His father is a National Living Treasure for his sashimono, or small wooden objects. You can find his Facebook page here. A look at his main studio space and a wall full of some of his planes. 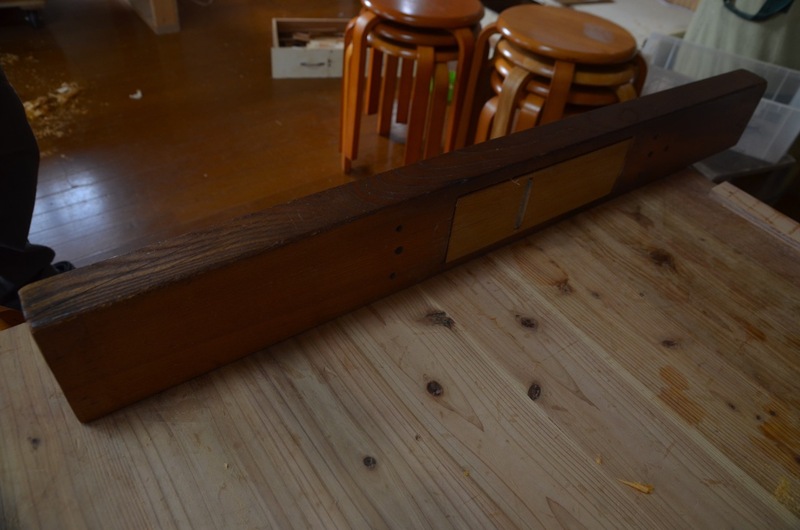 Very interesting "bench." 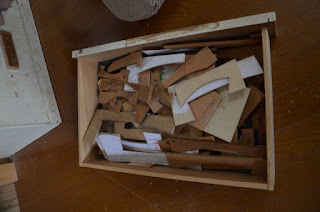 Nakagawa is wearing a wooden block. 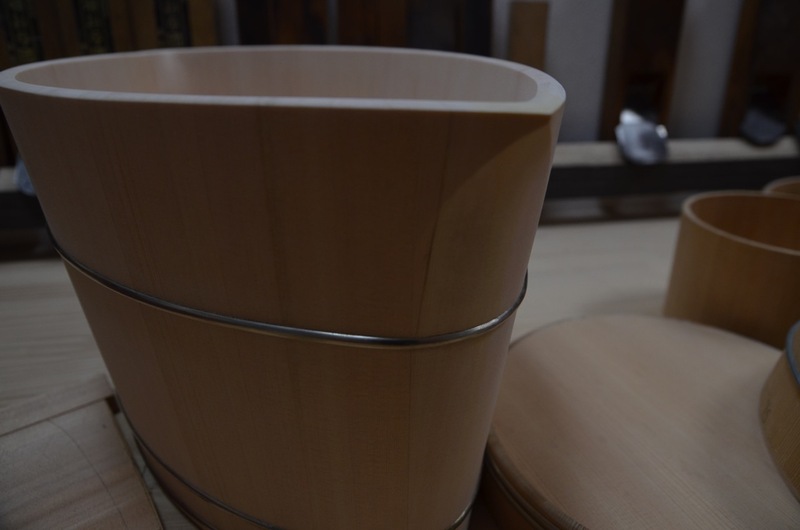 This is called a hara ate and my tub boat teacher had a gorgeous one. Bucket makers use this to back up their work while shaping with drawknives. 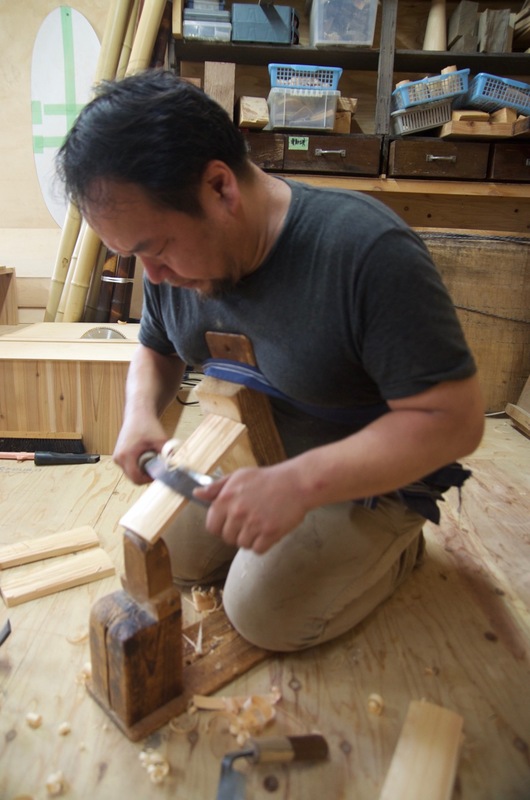 Nakagawa is kneeling on another bench that traps the other end of the workpiece. The classic patterns used by bucket makers. The cutout reflects the outside curvature of the stave and provides the proper angle for edge. 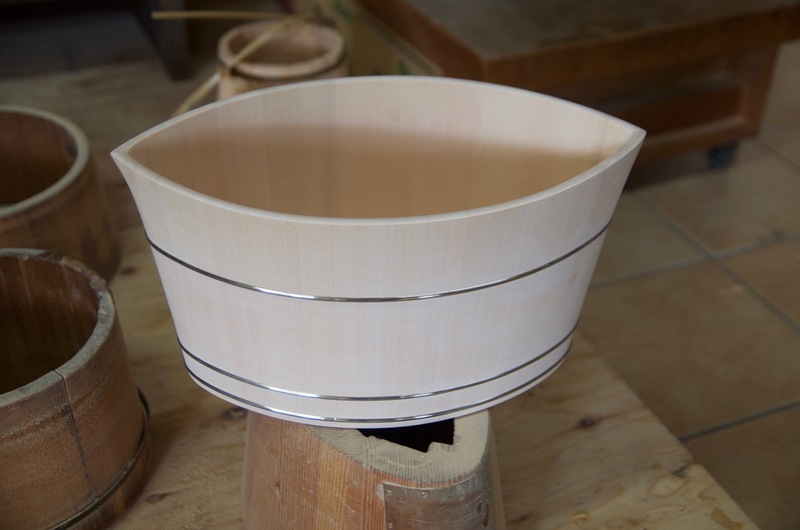 My tub boat teacher's patterns the outside edge was shaped to the curvature of the inside of the staves. Not sure why Nakagawa's patterns don't have that. Various sleds meant to hold stave material for running through the tablesaw. 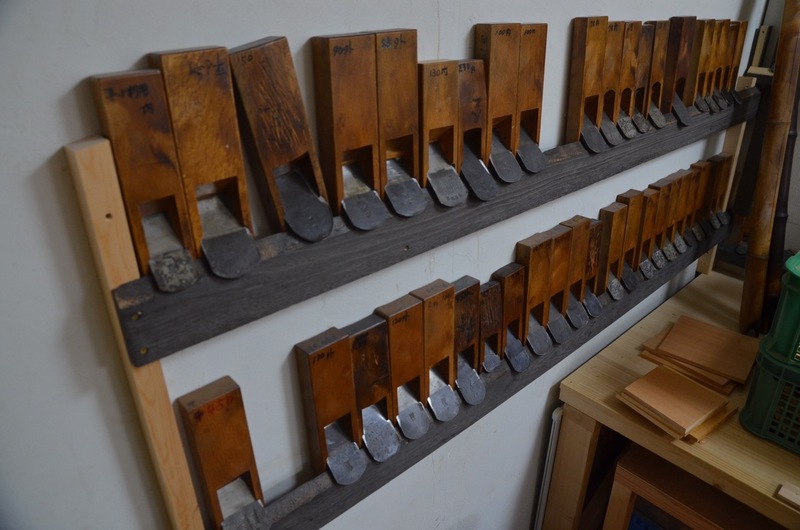 His joiner plane is ingenious, a type common to bucket makers, a long hardwood block with an insert in which you drop a normal hand plane. 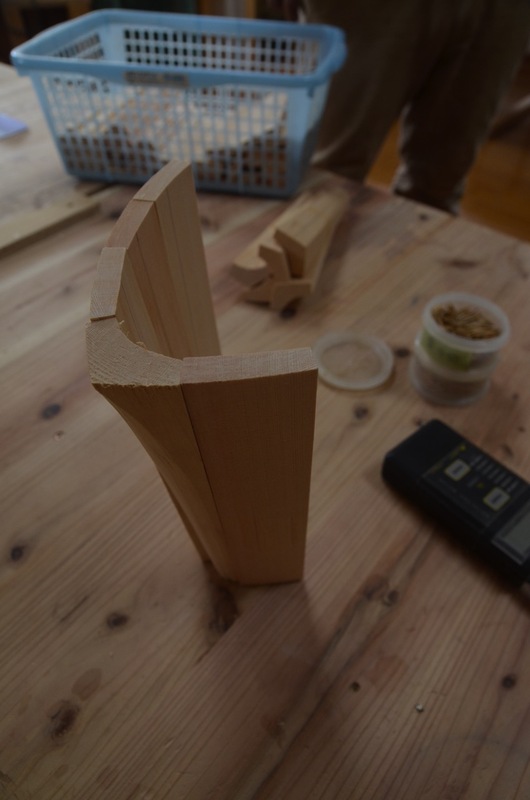 Here Nakagawa is assembling the staves, using tiny bamboo nails like dowels, to one of his signature pieces. Here is the vessel. 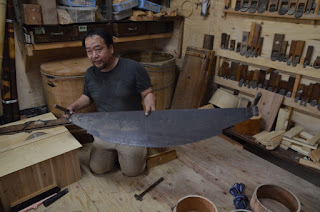 Nakagawa is one of a handful of Kyoto craftsman working with a European designer on a project marrying contemporary design with traditional Japanese crafts. 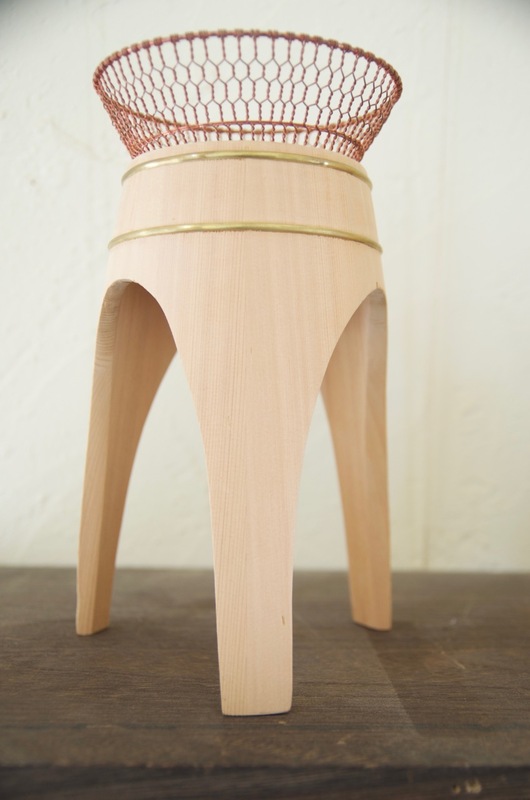 The initiative is called Japan Handmade and you can see Nakagawa's work at their website here. He's garnered a good deal of deserved notoriety for his work. Another of his piece's derived by bucket techniques. 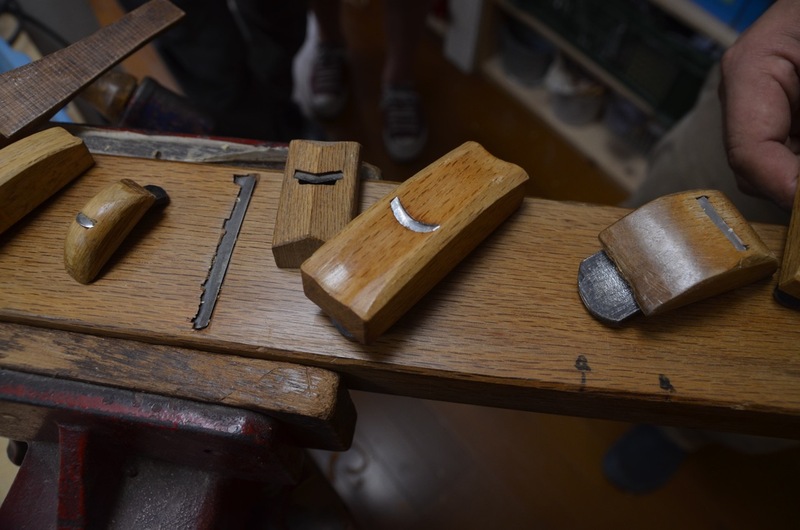 Some of his tiniest planes, sitting on the sole of a normal plane gives an idea of scale. Nakagawa holding his grandfather's ripsaw. He currently has two apprentices working with him. He's adamant about maintaining these traditions and supporting the craft. I blogged about one of his former apprentices who set up his own shop in Kyoto. See that post here.